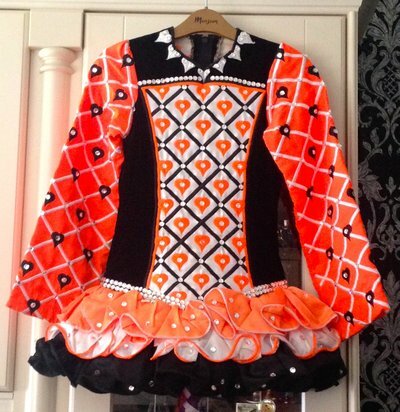 Black, Orange and White Gavin with an a-line bodice and sleeves covered in black and Orange hearts. Dress has approximately 1000 swarovski clear crystals. In excellent condition and very light to dance in. Orange kick pants to match. Asking Price: £200.00. Shipping costs are not included in the asking price. Sale is final.